Robert Johnson is the best-known of all the Delta blues musicians. In part, this is because of his extraordinary, charismatic talent, which has inspired legends and influenced generations of blues and rock artists since. Luck also plays a part, however: although Johnson recorded only 29 songs (13 of them twice) over two recording sessions in 1936 and 1937, he was fortunate enough to record them for Vocalion, one of the better quality record labels, and to this day his recordings bear little of the surface noise that plague the recordings of so many of his fellow Delta bluesmen. “Terraplane Blues ” (named after the Terraplane automobile brand) was Johnson’s signature tune and first and best selling single, and it is a great showcase for his remarkable range on both vocals and slide guitar. Johnson had a chameleon-like ability to copy and absorb the unique deliveries of his contemporaries, in the process making them his own. On this record, he sifts effortlessly from style to style – he sings high, he sings low, he sings falsetto, he moans, he growls and he even delivers some spoken lines. His guitar does similar gymnastics, starting with a slow, wailing slide style, but transitioning to more upbeat, intricate playing as needed, or becoming a percussion instrument as Johnson just bangs out the rhythm on it. It is a remarkable performance, but only the tip of the iceberg of what Johnson would accomplish in his too-short career. Johnson bangs out a slow, percussive beat on his guitar strings, adding some spare finger work here and there. And he sings with a slow, deliberate voice in a narrow register. Despite the lack of fireworks, or perhaps because of it, the song is amazingly deep. Stripped of all gimmicks, Johnson’s stunning talent remains undiminished. In fact, listening to him perform this way, with nothing but his raw charisma on display, adds extra weight to the cold, calculated lyrics, making this performance as electrifying as anything in his catalog. 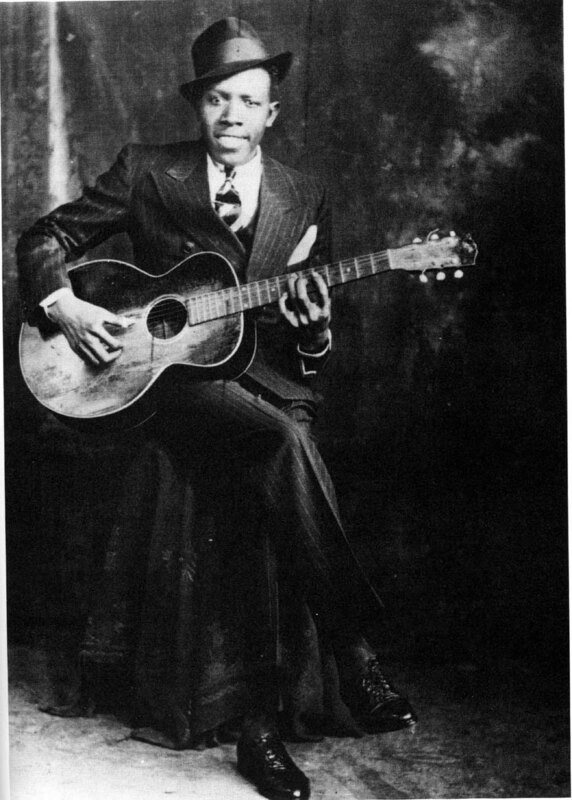 Johnson was a tremendous innovator on the guitar, and perhaps nowhere is that more evident than on “I Believe I’ll Dust My Broom .” When guitarist Keith Richards of the Rolling Stones first heard this record, he is reported to have asked, “Who is the other guy playing with him?” – unable to fathom that Johnson could simultaneously be playing the rhythm and lead parts so seamless on the same guitar. Listen closely and you will find yourself similarly astonished. Although the technique is frequently copied on electric guitar today, at the time it was revolutionary. Johnson keeps a steady, boogie beat on the low strings while he rapidly picks the high strings for variations on the main theme. The vocals are also quite engaging, and Johnson exhibits jazz-singer like timing in delivering them: never quite on the beat, but always aware of it. This is one of the more lighthearted blues Johnson recorded, and it is fun to listen to. It tells the story of a man who catches his woman cheating on him and “dusts his broom” – slang for leaving her completely and forever. Afterwards, he looks for another woman, starting in nearby towns (West Helena, East Monroe) and, in a humorous turn, ending across the world in places like China and Ethiopia. 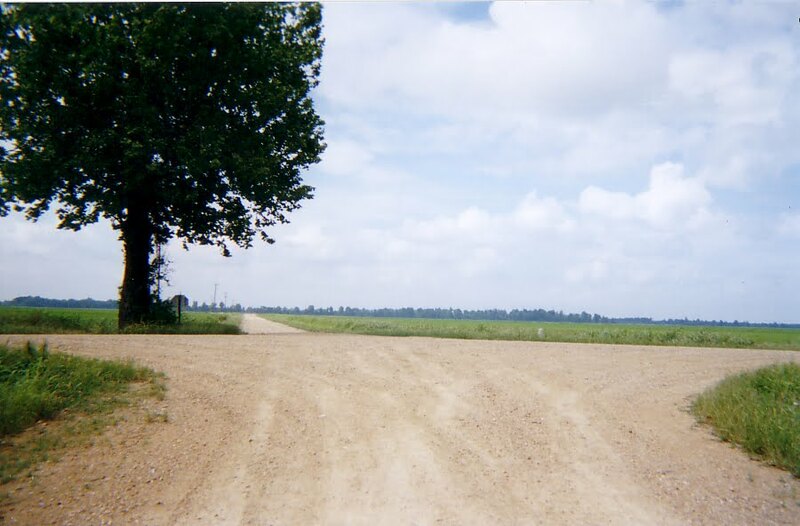 One of the most oft-repeated parts of the mythology surrounding Robert Johnson is the story of him meeting the devil at the crossroads one night and selling his soul in exchange for his tremendous talent. While it is certainly possible to listen to “Cross Road Blues ” in the context of that legend, it’s not necessarily the best interpretation. On the surface, the song can be read as no more than a tale of being stranded without transportation: “I tried to flag a ride / Didn’t nobody seem to know me, babe / Everybody passed me by.” Metaphorically, the crossroads could stand for any number of trying turning points in the narrator’s life. Johnson opens the song with a strong spiritual plea: “I went to the cross road / Fell down on my knees / Asked the Lord, boy, for mercy / Save poor Bob if you please.” In other places, however, he sings of the loneliness of not having a woman. Regardless of the interpretation, there is certainly a strong sense of despair throughout, and it is Johnson’s conveyance of that emotion that has made the recording so popular. From the moment his voice cracks hitting the high, opening note, you can feel the narrator’s torment. Both his voice and his guitar oscillate between deep, introspective tones and uncomfortably high ones. He plays the guitar’s high notes sharp and choppy, amplifying the sense of anguish. One of Johnson’s most soulful recordings, he begins the song with a moan and his singing never strays far from moaning. Even when he injects a spoken interlude at one point, his voice is a low mumble. His remarkable slide playing is equally soulful, diving in an impressive arc from the high notes to the low. Best of all, though, may be his brilliant use of space, as he stops playing a few times, holds the silence a second longer than expected, and then snaps the guitar back into place.